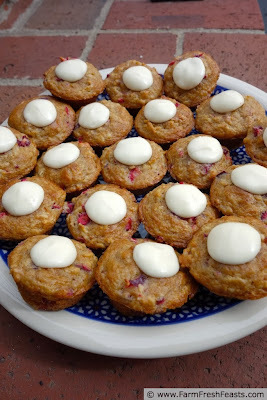 A pretty little lightly sweet muffin with cranberries, Greek yogurt-soaked oats, and a candy topper. 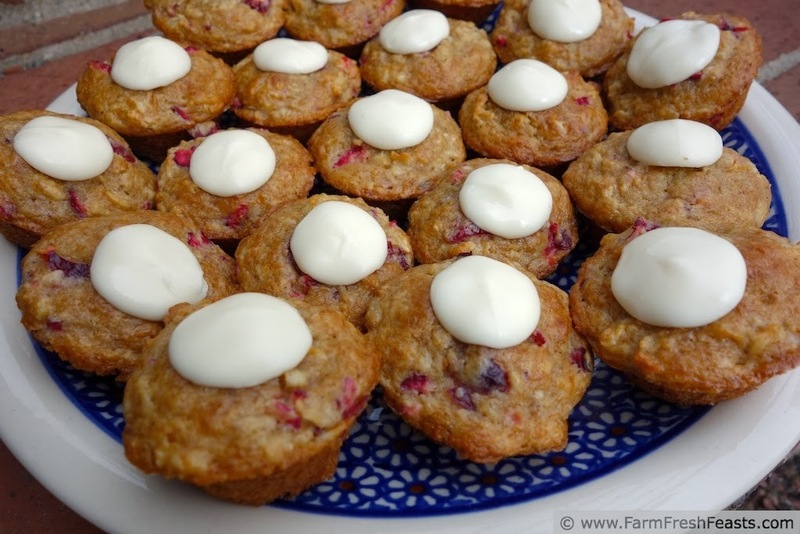 I buy cranberries when they are in season and inexpensive, then I store them in my fruit and veg freezer (not to be confused with the meat freezer) until I'm wanting some fruit for a muffin and open the freezer up, scan the contents, and think 'well, why not cranberry muffins?' That was an entirely run on sentence. I see where my son gets it from. I was thinking about my usual Soaked Oat muffins, but was out of buttermilk--though I did have a bucket of plain Greek yogurt. A quick check of my muffin bible, Muffins: A Cookbook (Amazon affiliate link) reassured me that it was possible to use yogurt in muffin batter, and in fact their recipe for Cranberry Yogurt muffins is very slightly adapted here. I didn't use the entire bag of cranberries in this recipe, but don't go on a rant about it like I did, instead come on back next time, because I will share the Cranberry Chicken Meatballs with Cranberry Gravy I made using the rest of the cranberries I'd chopped. Another Note: I made these to serve as an after school snack to a bunch of girls (who came over to unplug my fruit and veg freezer work on a school project). 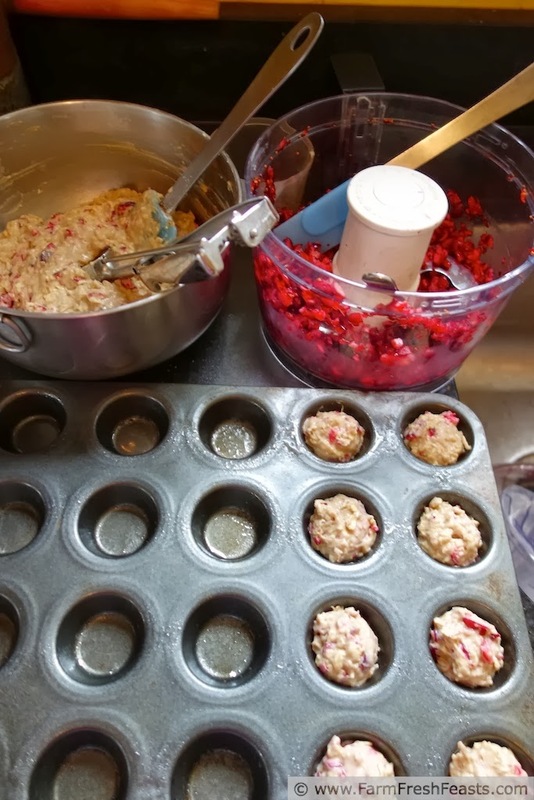 I was concerned that the cranberries would be too tart, so I added a candy melt for a hit of sweetness when you popped the muffin in your mouth, and made them mini because they looked cuter (sort of like wee Oliver, our new-to-us wiener dog). If you don't have or don't want to use candy melts, please feel free to bump up the brown sugar to 1/2 or 3/4 cup if you're concerned about the tart vs sweet level. 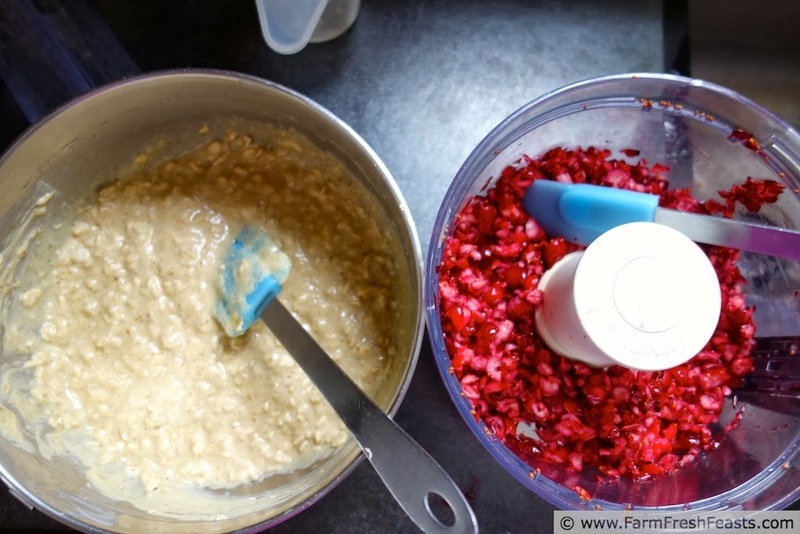 In a large bowl, combine oats and yogurt. Set aside for at least 30 minutes, up to an hour if you can. You could chill the mixture overnight as well. When you're ready to bake, preheat the oven to 400 degrees Fahrenheit and spray a mini muffin pan with oil, or line with paper liners. Add the oil, sugar, egg and vanilla to the bowl and mix well. Dump the dry ingredients (flour through spice) and stir until just barely combined, then stir in the cranberries until barely mixed. You don't want your muffin batter to be all nicely mixed like a cake batter is what I'm saying. Leave it a bit rough. Bake for 12 minutes, then remove from the oven. Turn off the oven. Place a candy melt on each muffin, and return to oven for 2 minutes. Cool for 5 minutes in the pan, then finish cooling on a rack. Makes about 3 dozen. *You have no idea the gnashing of teeth I went through to choose the appropriate fowl for this analogy. First I thought of chickens, and though I have little chicken experience I'll generalize that most chickens do not take care of their creations all that well. I thought of geese, but I've seen geese nest on sidewalks and in the middle of hardware store parking lots which shows a lack of judgement that I feel I don't share. I mean, I have a clipboard for all these random bits of paper, and a spreadsheet for published posts. I'm all organized and stuff. I finally settled on swans, because when I walk through the fancy area of town there is a place with Trained Gardening Swans (we've seen them weeding) and their nest is epic. Ideally situated, sumptuous, and constantly attended by Mr or Mrs Swan. I aspire to swandom. Cranberries. Cranberries. Oh, I am so ready for cranberries. I got a craving for cranberry muffins or bread last February and they were all gone from the store. The one year I didn't stock up in the fall. That ain't gonna happen this year! :) And when I get some, these muffins will go to the top of the list of recipes to make. I've been on a muffin kick, but not mini muffins. Thanks for the reminder that tiny muffins are a good idea! I am hoping to make space in the fruit and veg freezer (aka microwave stand) for cranberries before they disappear from the stores. I'd like to be on a muffin kick, but with sourdough starter I keep making sourdough waffles on the weekends and the kids eat the extras for breakfast on school days. Aren't mini muffins so adorable? I love them! 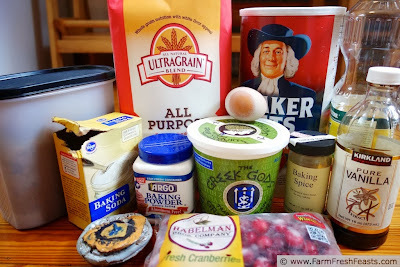 I'm actually blogging some cranberry apple muffins tomorrow - only they aren't minis. Yours looks so tasty! Mini muffins are adorable, mini wiener dogs are adorable--lots of things are cute in miniature. I'm loving your apple recipes--so creative! And I'm sold. I want cranberry muffins with white chocolates on top. I also want the life of a swan. They've got it made. Who knew? Oh, that'd be you! I dunno, swans seem to spend undue amounts of time on their feathers (she says as she prepares to make her annual haircut appt). Thanks! Out of the bogs and onto the blogs . . . just popped into my head this morning. Apparently I need my first mug of tea real bad. These look so good, Kirsten! I too love to stock up on cranberries when they're on sale, but I don't have as many freezers as you do. Thanks for the yummy recipe! Is it crazy to admit I kinda want more freezers? Or at least to exchange the fruit/veg freezer (aka microwave stand) for one as tall as the beef freezer. Then I'd be set . . . nah, I'd fill it up with tomatoes and whine about no freezer space for bread or something. I'm glad you enjoyed them, and thank you for your sweet words!